Our events are free so come on by! All are welcome! Hanukkah and Christmas have been in competition for generations of American Jews! We will explore what it means to maintain our particularity as Jews within our larger culture as we partake in a Menorah ornament craft activity and sip our specialty cocktail, “The Geltini.” Led by Rabbi Josh Buchin of the Jewish Community High School and Mychal Copeland of Sha’ar Zahav. Co-presented by Sha’ar Zahav and Reboot. Suggested age group 21-37. Free tickets here. If you’re not able to reserve your tickets, just show up. For more information contact heidy@shaarzahav.org or tanya@rebooters.net. 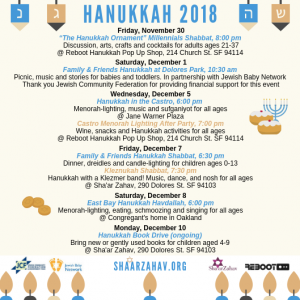 Join SZ, Jewish Baby Network SF, PJ Library and InterfaithFamily as we kick off Hanukkah at Dolores Park. Rabbis Mychal Copeland and Reuben Zellman will lead us in Shabbat music and storytelling. Bring a blanket, pack a lunch, and we’ll provide kosher snacks. 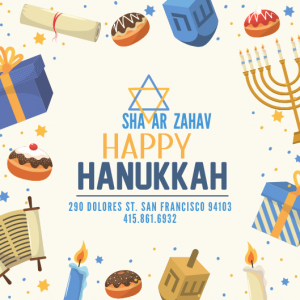 Light candles, sing songs, spin the giant dreidel, eat sufganiyot (jelly donuts) and dance at our Annual Hanukkah in the Castro. We are teaming up with Castro Merchants again to host this fun-filled evening to celebrate light and community. Bring your own Menorah (BYOM)! Wine and snacks and all-ages free Hanukkah activities. 7 p.m. – 8 p.m. Hands-on book-binding workshop, 8-8:30 p.m. Workshop on ecological gift-wrapping, creative ideas to make beautiful gift wrapping without commercial wrapping paper. Free tickets here. Gather for dinner, community and fun Hanukkah making adventures: candles, dreidels and more. Then light candles with the congregation at 7:30. Not exhausted yet? Stay for a festive Klezmer Shabbat until bedtime. For people age 0-13 and their families & friends. No RSVP required; just come! Bring your own Menorah (BYOM)! “Kleznukah Shabbat” – it’s what you get when you cross Hanukkah with a Klezmer band! Come light candles, sing songs, delight in familiar prayers melded with klezmer rhythms and melodies, dance, and of course, eat and drink! Cantor Sharon Bernstein will be at the piano, joined by master klezmorim Stu Brotman on bass, Sheldon Brown on clarinet, and Bruce Bierman on feet with music and dancing during and after services. Don’t miss it! Bring your own Menorah (BYOM)! For address and to RSVP contact Claudia Bernard at claudia.l.bernard@gmail.com. Join us as we gather for Havdallah, menorah lighting, eating, schmoozing, singing and celebrating! Please bring a vegan or vegetarian potluck dish to share and/or latkes! (Bring your latkes already cooked; they can be heated up on site). We ask that you also let Claudia know what you plan to bring. For information contact Terry Fletcher at gillianf19@gmail.com. Give the gift of reading this Hanukkah. Bring new or gently used books for children aged 4-9 to the collection bin in the foyer. We will give them to the Jewish Coalition for Literacy who will distribute them to Bay Area public schools. Please no baby, teen, adult or PJ library books.